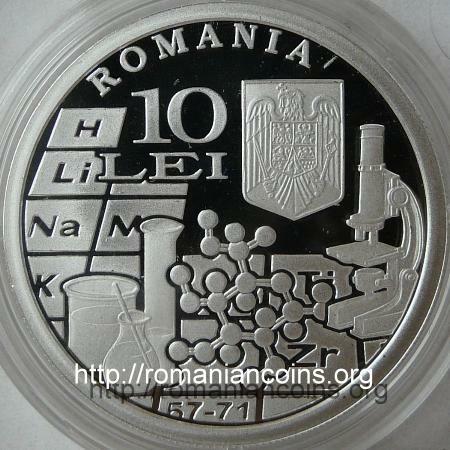 Obverse: ROMANIA, face value "100 LEI", coat of arms of Romania, the upper left corner of the periodic table, with symbols for hydrogen, lithium, sodium and potassium etc., laboratory glassware, spatial structure of a molecule, at right a microscope Reverse: year 2011, bust of Romanian chemist Costin Neniţescu and his name written with capital letters, COSTIN NENITESCU, Romanian variant of the logo of the International Year of Chemistry (three superimposed sheets of paper, on the upper one 2011, C and "CHIMIA" meaning "CHEMISTRY"); laboratory glassware, a planetary model of the atom and skeletal formulae of two substances discovered by Costin Neniţescu, inscription "ANUL INTERNATIONAL AL CHIMIEI" meaning "INTERNATIONAL YEAR OF CHEMISTRY"
Year 2011 was designated (in December 2008) as International Year of Chemistry by the United Nations, UN. The initiative was carried out by IUPAC (the International Union of Pure and Applied Chemistry) -organization established in 1919 - and was supported by UNESCO. Year 2011 was intended to be a feast at all levels, from world to local, of chemistry and of its achievements. Principal goals were the increase of interest in the young people about chemistry and a better appreciation of chemistry by the public. Costin Neniţescu was born in 1902 at Bucharest, in the family of an advocate. His father, Dimitrie Neniţescu, was engaged in politics with the Conservative Party, and was minister for several times. Costin studied chemistry at Zurich and Munich, later being professor at the University of Bucharest. 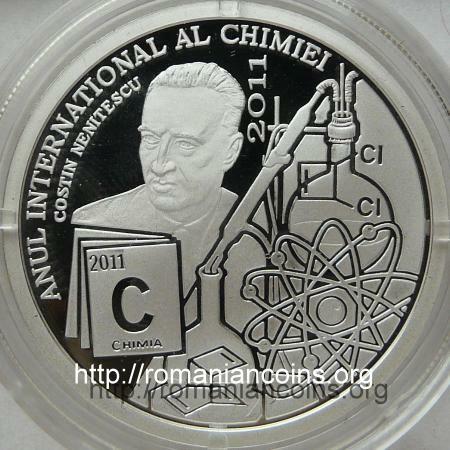 Neniţescu is considered to be the founder of the modern organic chemistry in Romania. From 1955 he was member of the Romanian Academy. Costin Neniţescu published numerous important scientific papers. Nowadays there are several substances that bear his name, "Nenitzescu", e g. a dichloride, (cis-3,4-dichlorocyclobutene) discovered in 1964, and Nenitzescu's hydrocarbon - (CH)10, or tricyclo[4.2.2.02,5]deca-3,7,9-triene - discovered in 1972 , . 1. Andraos J., Named Organic Reagents (Part 2), http://careerchem.com/NAMED/Structures%28L-Z%29.pdf, retrieved January 2012. 2. Banciu M., Professor C.D. Nenitzescu. A Tribute. ARKIVOC 2002 (ii) 1-6, http://www.arkat-usa.org/get-file/20277/, retrieved January 2012.